The subject of this book is model abstraction of dynamical systems. 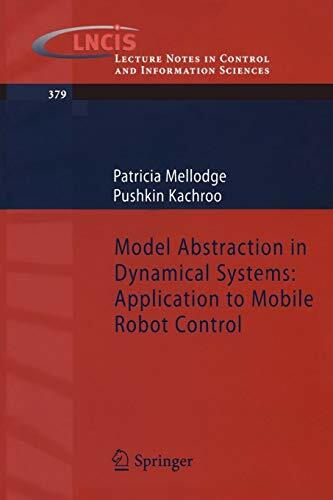 The p- mary goal of the work embodied in this book is to design a controller for the mobile robotic car using abstraction. Abstraction provides a means to rep- sent the dynamics of a system using a simpler model while retaining important characteristics of the original system. A second goal of this work is to study the propagation of uncertain initial conditions in the framework of abstraction. The summation of this work is presented in this book. It includes the following: · An overview of the history and current research in mobile robotic control design. · A mathematical review that provides the tools used in this research area. · The development of the robotic car model and both controllers used in the new control design. · A review of abstraction and an extension of these ideas into new system relationship characterizations called traceability and -traceability. · A framework for designing controllers based on abstraction. · An open-loop control design with simulation results. · An investigation of system abstraction with uncertain initial conditions. 2. Model Abstraction In Dynamical Systems: Application To: Mellodge P.